Emotional Intelligence has made a huge splash in the professional world. Literature covering all fields is touting the importance of this skill. Bursting into a world where academic achievement and the Intelligence Quotient ruled all, Emotional Intelligence has paved the way for a revolutionising of the hiring and training practices in major corporations and organizations. A study conducted in a Fortune 400 company in 2006 showed that emotionally intelligent individuals received superior ratings from peers and supervisors in terms of interpersonal facilitation and stress tolerance and overall job performance. There is a reason that 34% of hiring managers are giving more importance to Emotional Intelligence when hiring and promoting employees post-recession: that it relates positively to job performance. Being able to manage emotions is a powerful tool in relation-building, and employees with such ability are an asset to an organization. While most individuals possess a certain level of Emotional Intelligence, there is a need to identify barriers to its use. Individuals with high Emotional Intelligence are easier to manage and supervise because they are skilled in motivating themselves, managing stress and resolving conflicts with. Not only does this allow managers and supervisers to distribute their resources better, it makes for a more satisfied and productive workforce. It also results in increased effectiveness of teams. These skills can be learned, given the right training and guidance. This program breaks down Emotional Intelligence such that participants understand its components thoroughly, and are able to apply the detailed principles both to themselves and the people around them. Investing in the Emotional Intelligence of your staff will bring returns that will impact your bottom-line both directly and indirectly. My Habits – How do I change? > What are our critical success determinants in our lives? > What are the beliefs that limit or prevent our success? 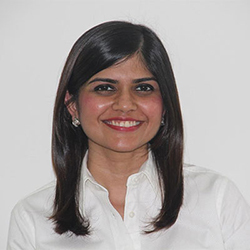 Hetal Doshi holds a Masters in Organisational Psychology from Macquarie University (Sydney, Australia), Honours in Psychology (Second Upper Class of Honours) from Murdoch University (Perth, Australia) and a Bachelors of Arts majoring in Psychology from the National University of Singapore (Singapore). She is a HRDF Certified trainer and is currently completing her International Coaching Federation (ICF) accredited coaching certification. She also is a certified user of several profiling tools including MBTI, DISC, Management Potential Evaluation (MPE,), Facet 5, SHL and Genesys. Hetal has been in the business of organizational psychology for several years with a focus on consulting, training, coaching, talent selection and development, psychometric testing, developing assessment centres, outplacement and crisis consulting. She has worked successfully with individuals of varying job levels within the Banking, Services, Government, Universities, Manufacturing, Oil & Gas, Telecommunications and Transportation industries. Her work has taken her to countries and cities including Bangladesh, Hong Kong, Jakarta, Mumbai, Perth, Singapore, Shanghai, Sydney and Thailand. Within Malaysia, she has carried out work in states not limited to Cyberjaya, KL, Penang, Kuching, Johor, Seremban and Terrenganu. Some of the clients Hetal has worked with in the past include Bank Negara, Deutsche Bank, iCIMB, OCBC Bank, HSBC Bank, Bank Muamalat, Monash University, Mahsa College, Intel, Infineon, iPertintis, Kementerian Dalam Negeri, MIDA, Imigresen Malaysia, TUDM, Petronas Carigali, Sarawak Energy, Technip, HP, Ericsson, Woman’s Aid Organization, Nursing Professional Group, MISC, DHL, GE, Air Asia, Johnson and Johnson. Hetal’s core lies in Emotional Intelligence and seeks to identify and maximize the potential of all individuals within the workplace through gaining a deep appreciation of their personality, abilities, motivations, strengths and challenges.